In this article, Steven M. Butnik takes a look at a number of options regarding slow processing speed. It’s not unusual for gifted students to have slow processing speed. Of itself, slow processing speed is not a formal learning disability, but having it can frustrate students, teachers, and parents. As a clinical child psychologist specializing in assessing and treating students with attention deficit disorders and other learning problems, I often hear parents tell me their very bright child isn’t finishing her classwork or that homework takes hours and hours to complete. Through observation or formal assessment of their child, these parents have been told that the child has slow processing speed. Understanding the role of slow processing speed is essential. Gifted students with processing speed problems who are “missed,” misdiagnosed, or mis-taught may become discouraged, depressed, undereducated, underemployed, or worse. By contrast, when these twice-exceptional (2e) children are understood and well-addressed educationally, they can become treasures who shine in unique ways. In this article I will explain what sort of struggles children with slow processing speed experience; where slow processing speed comes from; how it can be identified; and what students, teachers, and parents can do to reduce or eliminate its impact. At home, parents easily see slow processing speed in areas outside of homework. Aiden’s mom asked him to get dressed ten minutes ago and when she checks on him, he hasn’t even begun — and he has to be at the bus stop in five minutes! Nancy’s family is in the car waiting for her and she, as usual, is still in the house, looking for her book. At school, Jack didn’t finish writing his assignment in his planner when the bell rang, so he left out important information because he couldn’t afford to be tardy again for his next class. When Emily didn’t finish her classwork, her teacher sent the unfinished work home to be completed along with her usual homework. These children all have slow work pace, which leads to problems at school and at home. They need the understanding and help of parents and teachers so that they can succeed and so that their self-esteem is not damaged. Understanding the source of the problem in children like these is a critical part of knowing how to help them. Thorough medical and psychoeducational evaluations are necessary because there are many sources of slow work pace. It can be associated with physical illness or injury such as low thyroid, epilepsy, or traumatic brain injury. It might be related to other physical problems such as lack of adequate sleep or reaction to medications. It might also be part of Attention Deficit Hyperactivity Disorder (ADHD), learning disorders, and/or emotional factors. We’ll take a look at some of these possible causes. Children with the predominantly inattentive subtype of ADHD may have a sluggish cognitive tempo. They typically daydream, stare off, and appear spacey. They may be mentally foggy, underactive, slow moving, and lethargic. Their work is often slow and error prone. Their brain activity shows patterns of under arousal in the portion of the brain associated with focus and planning. In addition, children with ADHD typically exhibit poor executive functions, brain-based behaviors that contribute to effective functioning. A useful model of executive functions (See the figure below.) has been developed by Thomas Brown, Ph.D., a psychologist at Yale University. These are the functions, according to Brown, that are impaired in attention deficit disorder syndrome. Some children take more time to complete tasks due to trouble with activation. A student may not begin a task due to problems organizing time or materials, or due to reluctance, uncertainty, lack of confidence, or anxiety. Other children may take more time to complete tasks because of problems maintaining focus. While time is passing, these students may be distracted or daydreaming, drawn to other, more interesting stimuli. Effort includes processing speed as well as mental stamina. When effort is a problem, the child’s work pace is very slow and he may complain that his “brain is very tired.” When the problem is emotional, on the other hand, children find it hard to regulate their feelings. They might melt down when starting to work or encountering a frustrating task; or they may refuse to work, be argumentative, or have tantrums. Problems in working memory can add to the time it takes a child to complete tasks. After reading a paragraph, a child with poor working memory may forget what she just read and need to read it again; or he may stop working on a class assignment because he forgot the directions. Finally, when action is a problem, the child has trouble sitting still, fidgets with objects, or may want to stand or walk around when working. An additional issue that children with ADHD face is having a poor sense of time. For them, time seems to go more slowly during the tasks they feel are boring while moving more quickly for tasks they find interesting. When planning work tasks, a child with ADHD may underestimate how long the task will take; and when playing, the child may be unaware of how much time has passed. Taken together, poor executive functions and poor time sense can make homework take hours to complete and create major stress. Processing speed is an element of intelligence, as measured by many tests of cognitive ability, including the Wechsler Intelligence Scale for Children (4th Edition). Scores for both the Working Memory and Processing Speed subtests make up the WISC-IV’s Cognitive Proficiency Index. These abilities are separate from the WISC-IV’s General Abilities Index, a measure of core intelligence derived from an individual’s Verbal Comprehension and Perceptual Reasoning Indices (verbal and nonverbal abilities). Many 2e children show substantial differences between their verbal abilities and working memory capacity and/or between their nonverbal abilities and processing speed. Working memory and processing speed scores are often low in 2e children. The WISC-IV’s Processing Speed Index is calculated from the Coding and Symbol Search subtest scores. A supplemental subtest is Cancellation. These three subtests, described in the next paragraph, rely on rapid visual/motor analysis and output. Because processing speed can be affected by a number of factors, it is not a unified construct like other parts of the WISC-IV. See the figure below. Each of these three subtests taps different abilities that contribute to the Processing Speed score. Coding, which requires children to draw symbols, is heavily influenced by grapho-motor demands. Children with poor handwriting or dysgraphia may struggle with this task. Symbol Search has less emphasis on motor output but requires rapid differentiation of abstract symbols. Cancellation, the supplemental Processing Speed subtest, makes use of concrete images rather than symbols. Reading Fluency. For three minutes the student quickly reads simple sentences and answers yes or no to each. Writing Fluency. Using three words and a picture, the student quickly writes simple sentences for seven minutes. Math Fluency. The student rapidly performs simple calculations for three minutes. 2e children who have trouble activating, are inattentive, or have sluggish cognitive tempo may struggle on all of these tasks. 2e children with slow motor output would have less trouble on Reading Fluency but would do more poorly on the Math and Writing Fluency tests. Working memory problems would likely have a greater impact on Math Fluency than on the other fluency tasks. A significant difference between abilities and achievements. Grapho-motor problems (dysgraphia). Individuals with dysgraphia have serious trouble forming letters and numbers; their handwriting is slow and labored; they may have trouble with spacing between words; they mix upper- and lower-case letters; etc. Because neatness only comes with their taking much time, their written work can be very strained and painful. In addition to cognitive and attentional variables, a number of emotional factors can increase how much time it takes for students to complete work. When students are anxious, their processing speed can slow due to self-doubt, uncertainty, second-guessing, and self-consciousness. One child has developed a “rule” that if he hesitates when reading, he “has to” reread the entire passage. After a thorough psychological and educational evaluation, a plan can be developed to reduce the impact of slow processing speed. Intervention strategies fall into three categories: school-based, home-based, and child-based. Regardless of the category of services for which the gifted student qualifies, it’s important to prevent slow processing from interfering with a child’s success. Teachers should be aware of how slow processing speed can affect the performance of bright students and strive to differentiate their instruction. Gifted students with slow work pace should not be denied gifted education opportunities. To provide suitable interventions, a teacher or school needs to determine the source of the problems and tailor interventions to the individual student’s needs. To the right are examples of interventions that can address them. Monitoring time spent on homework and adjusting assignments as necessary. Parents should become aware of the impact of slow processing speed on their child’s daily living and develop plans to reduce that impact. Because students with slow processing speed often have major problems with homework, parents should work with the teacher to determine how much time the student should spend on each homework assignment and what to do if the time is exceeded. The goal is to avoid homework battles. If handwriting interferes with work pace, some of the school-based suggestions in the table can be implemented at home. Parents should avoid personalizing, punishing, and reacting emotionally, remembering that slow processing speed is not purposeful and can improve. Parents can help by providing more structure, using schedules, timers, clocks, alarms, and incentives. With older children, it can pay to involve them in the problem-solving process. Children with ADHD may benefit from stimulant medications such as Ritalin, Concerta, Adderall, or Vyvanse. This type of medication may not directly increase actual processing speed but can often help with activation and focus, increasing a child’s work pace. Once a child is properly diagnosed, parents can explore the medication option with their child’s pediatrician or medical specialist. It’s also important for parents to monitor and address any sleep problems that may occur and to encourage sound nutrition as well as frequent, vigorous exercise. Because some very bright students with slow processing speed do not see themselves as smart, it’s important to help them understand the nature and pattern of their abilities. It may help to remind them that all people have strengths and weaknesses and that having a slower pace does not mean one is not smart. One student loved that I referred to him as an intellectual tank — not very fast, but extremely powerful. Some students make good use of timers and alarms to help them track time. A teenager I worked with began using an alarm clock in the bathroom to remind him to get out of the shower. It can also help to conduct a time study. Parents can use a stopwatch to determine how much time it takes the child to complete routine tasks like doing a chore or getting dressed for school. These times can be used as goals to work toward and rewards can be provided when the student completes a task within the allotted time. When they go unrecognized and their needs go unaddressed, gifted students with a slower pace can feel discouraged and demoralized. However, once they are understood and efforts are made to help reduce the impact of the slower pace, these students’ best abilities can shine. Parents may need to take the lead and arrange for evaluations, educate those involved in their children’s lives, and provide their child with unwavering support and encouragement. Steven Butnik, Ph.D., is a licensed clinical psychologist and co-director of ADDVANTAGE, PLLC in Richmond, Virginia, a private practice dedicated to evaluating individuals with attention problems and other learning problems. In addition, he is trained to perform quantitative electroencephalography (qEEG) and neurofeedback as well as to offer an evidenced-based training program to improve working memory in individuals with ADHD. Dr. Butnik has written and spoken about various ADHD and learning issues, served as a consultant for a University of Virginia study investigating the roles of multiple ADHD assessment instruments, and was appointed as a reviewer/consultant for the Journal of Attention Disorders in 2008. My 20 yr old son also suffers from delayed or slow processing speed. I too like your "intellectual tank" reference. He was tested for ADD back when he was in first grade, as he was not ADHD (not hyper). The testing found he was borderline - after further testing it was found to be processing. We thought holding him back a year and getting help through IEP and occupational school therapy would help him get back on track. Unfortunately, it didn't - he continued to struggle and need support to help him process and understand throughout high school. College is difficult as he's trying to learn to manage this himself. As parents we question if they are lazy or just trying to get out of doing things, but that's not the case. This is a difficult lifetime struggle and can cause self-doubt, anxiety, and depression. Having a strong support system is important. Keeping on a strict schedule/routine, good sleep habits, repetition, breaking down things into smaller manageable pieces are all important. Having teachers/people reword / reexplain can help process it. Hello, I am in my 20s in a nursing program and have slow processing speed due to stress and anxiety. Do you know where I can find resources for adult students? I am currently seeing a psychologist and we are trying to come up with a plan with my school on how to support me, and I also would like to do more research for my own understanding. My grandson is 12. He was diagnosed 2 years ago with slow processing speed. I can't understand how he master a new video game with no issues but can't remember what he has just written 5 times. He is in 6th graded. He has an IEP at school but I don't think he receives much help. Any suggestions? My son has an extremely slow processing speed as well as everything that goes along with ADHD. How is it possible to get accurate IQ/neuropsych testing when some of the data is based on time to complete certain items? Our doctor said if you remove all of those parts of the test, our son would have an IQ of over 130. Include those timed parts and he tests at below average. It makes it difficult for schools to understand he is intelligent and capable of learning in higher level classes. I was diagnosed with an unspecified processing speed disorder when I was 11 and then later in life (around age 30) diagnosed with ADD. This article is extremely useful and inspiring in that it concisely explains an issue that I have been unable to adequately explain to others. It also makes me happy that someone was able to target this specific manifestation of ADD. I struggled with understanding during lectures and loosing attention because i was unable to catch up with lecture and start thinking about something. I was unaware that I have this kind of disability in school days but I got to know in my University after Dyslexia tests that i have slow speed processing problem. Now in my 30s i am again worried about day to day life and keeping up with rest of the people as this problem will remain rest of my life. So i have decided I will spend my life not doing job rather i would prefer own business and take my time to address the issues and make progress in life. I am a physician. Since I was a kid I was always one of the last people to finish tests. However, I could always finish in the allotted time (never needed time allowances) and had a higher accuracy than the vast majority, which resulted in better test scores. I went through medical school and passed licensing examinations without issues. However, as a resident physician working at a tough hospital with high expectations, I noted that I could not deliver patient presentations without extensive preparation (which took precious time). I also could not respond to emergencies optimally. I was forced to see a psychiatrist for evaluation, and was diagnosed with ADHD without any standardized testing. I had never carried that diagnosis before in my life. I was then fired from residency. As I was diagnosed in adulthood, I grew up thinking that I was normal (even smart). My childhood growing environment really emphasized succeeding at all costs, without assistance, no matter what disadvantages you are born with - and this attitude has done me much good in life. I read the material on this website with mixed feelings, as the reality of life is that if you cannot perform well enough without assistance to meet expectations, you will be axed. I do put into context that some of these people with slow processing speeds are currently children, and that they may respond poorly to the environment if not taken care of more, and thus won't reach their full potential otherwise. So perhaps helping them out so that they can have some achievement that they can be proud of will really help them grow better. However, I am not sure if this will breed entitled adults who feel like they should have assistance/more time on the job. Due to my childhood and work experiences (likely my colleagues share the same views since we are from similar backgrounds) - I just do not think this is a good attitude to have. People demanding more assistance just does not jive well with me. Perhaps a better approach would be to go a different path that plays to your strengths, and which still gets you to the same end goal. I looked hard for another residency, went to one with low expectations (since the ones with higher expectations all refused to hire me). I am now a fellow in a competitive subspecialty at a competitive institution. The fellowship was something that I had desired since medical school. The field pays well, has no emergencies, and does not require bedside patient presentations - all wins for me! Throughout all of this, I never talked about the ADHD diagnosis - because it will only hurt - as people either think it is an excuse you make for being incompetent or that you are just incorrigibly incompetent, and a real risk to them. Just my two cents. I am an adult with these same problems as described in previous comments. I have had this problem my entire life. I am 57 years old and all of the assistance provided for ADHD inattentive, slow processing, and OCD is provided for 28 y/o and younger. Is there any help for adults? This assistance that is offered to kid was not available back in the 70's. Can you claim disability for this? I need assistance getting ahead. I have a lot to offer. I am in 40s now and am glad to know there are other adults who struggle with processing speed. I understand the importance of sleep; while I take melatonin, the stress of life with respect to career success and providing for ones family takes a toll. I was fired from a job 2 years ago and the exact words in that awful meeting were "you're not picking it up fast enough". And I cannot help it if my brain is slow to comprehend a process. I've had this problem my entire life and have always been teased because of it. I get accused of being on drugs and what not which is really depressing. In the workplace I especially have a hard time because it takes me longer to learn a new job than the average employee. This of course gives me great anxiety for fear of being fired because I work in a "right to work" state meaning I can legally be fired for any reason at all. For my next job, I think I will try to work somewhere unionized so that i'm not in constant fear of being let go. I am a slow processor and so is my father and one of my children. Slow processing does not go away when you get older and the workplace is not kind to slow processors in some fields. It is important to provide career counseling to students with this condition to be sure they find a vocation that does not demand speed, but rather depth and for some innovation. Does anyone know of testing and help for adults? I am sure I have this and recognise a lot of the signs especially from Childhood. I have a 1st class honours in my degree so know that I am quite intelligent but struggle with auditory instructions. Our 8 yr old soon-to-be 3rd grade daughter was tested over the summer as ADHD inattentive type only, and slow processing. She scored within normal limits on everything else, including normal IQ. Our dilemma is she'll start grade 3 tomorrow and just putting a meeting for an IEP on the calendar will take up to 6 weeks. We're so concerned that her needs will be far from met. Meeting her teacher didn't make me feel any better as they're so focused on pacing guides and teaching them only the information needed for state testing. What is happening to the educational system? This country wonders why more people don't go into teaching as a profession? I'm wondering if home schooling will be better - I don't know but I'm struggling as to how to help her succeed the best way possible. I am so grateful to have found this article. Our son just graduated from a college curriculum focused on science, math and technology, and it has taken him longer and been much more difficult for him than his peers. Despite all the professionals we've consulted with over the years and the school professionals who provided great guidance through public school, he's never fully understood this key point -- he is very bright with one deficit in IQ testing, processing speed. I loved the analogy of the intellectual tank. I went over this article with him the other night and I could see relief on his face. Just wish I'd found this particular article a while ago! This article is fascinating and very helpful. It perfectly describes our 18 year old son who just graduated from high school and will be starting college in the Fall. In some ways we've felt like we've been dealing with and having to figure this out on our own for 18 years. This article helps validate what we've instinctively known in addition to all we've tried to do to help him along the way. We've definitely had some helpful support on the journey but have never felt anybody else has really "gotten" the issue. The good news is, despite often having to find our way through a very long unlit hallway, our son graduated 2nd in his class (3.99 GPA) and named "Salutitorion", achieved 1975 SAT score (300 points higher than he did w/o time accommodation), a Composite Score of 30 on the ACT and gained admission to some of the most selective colleges (i.e. Washington and Lee University and Pepperdine University in the U.S. and University of Saint Andrews in Scotland). I think the information in this article however is going to be so useful as he enters his next level of education, which will undoubtably present him with further increased challenges. A big thank you to Dr. Butnik (love the term "Intellectual Tank"!) and The Davidson Institute!! This article is interesting but I feel an additional form of support could be offered in the form of self regulating activities from an expert occupational therapist. Through the use of simple tailored daily exercises that encourage a calm, alert, and organised state, someone with attentional and disorganisational issues can find practical supports to self manage. Informative and thought-provoking article--BTW, The clock is called a "time-timer". To the posting on 1/22/15: By posting the comment about OCD and slow processing speed, I suspect that you have not done your homework on brain function and this condition. An OCD student does not have a "thought" filter, therefore they process 4x the thoughts of a non-OCD individual. Compulsion or not, this will cause the child to process slower than others. A simple google on OCD brain scans will clarify this. Slow processing is a serious problem for these students…one that would be less of an issue if more educators fully understood it. I appreciate the attention this article has brought to this. This article references slow processing speed and OCD -I disagree with what is stated in this section! I don't understand how the example can be related to slow processing speed as the "rule" (compulsion) isn't tied to his speed of process, it is tied to his speed of carrying out the action/task of reading the sentence. It has nothing to do with his ability to process, but with fulfilling the need of the compulsion. How do I increase my visual processing speed, not just find ways to cope? I need to fix the problem. I have completed graduate school, now that I am in the work force people are not at all understanding like they were in college. I just found the timer in question - Joseph Joseph Pie Kitchen Timer via Amazon. approx. $15. I am also very interested in finding out what more can be done to support the adult person on the job with a slow processing speed, particularly with working memory problems. Or can you go on disability for this problem? It always took me a long time to get my homework done when I was in school. Now I'm always late clocking out to finish my charting at work. I'm late most everywhere I go because I'm hurrying to finish up. I'm 59 years old and never have been able to work any faster. It takes me longer to study my patients' charts, then carefully organize my notes. Receiving a verbal report on my patients is difficult when they have talked at a fast pace on the recorded tape. Please help! My work exhausts me but I love being a nurse. Any ideas on how to address slow-processing speed at the workplace? I recently did some testing for myself and one major outcome was slow processing speed. I work in a fast-paced environment. Any suggestions? Thank you "Parent" for your very helpful comment. I was wondering what the clock was called and where you got it. It would be very helpful for my son. Very good article with great suggestions. 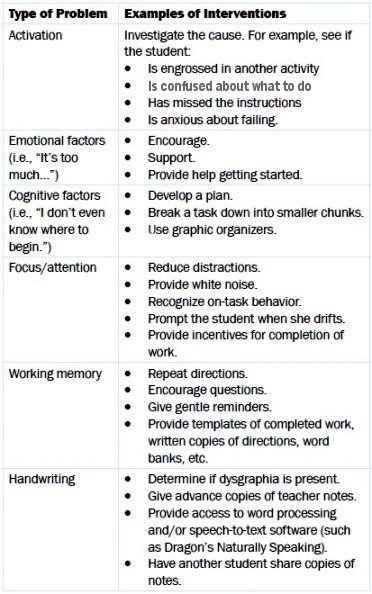 If I could add a couple more strategies...My son's processing speed is in the impaired range. I found an analog clock that is made for kids with processing speed "deficits." It gives a visual indication of time (i.e., the face of the clock is like a pie so, say, 6:50 is indicated by a red (or any color) "slice" of the hour with the 50 minutes already elapsed in white. Telling him he has ten minutes before the bus arrives means nothing to him but a visual representation does. At school, he is in a fully inclusive classroom but the teachers are required to have their daily lesson plans summarized with bullets highlighting main points. It's in a Powerpoint format that runs in the background as the teacher talks. My son is given a hard copy at the end of class.